A flash flood warning was in effect for parts of Los Angeles County through Friday night as heavy rains poured into the region. The National Weather Service issued a flash flood warning for Tujunga, Sunland, Lake View Terrace, La Crescenta, La Canada Flintridge, Burbank and Beverly Hills until 8:45 p.m. 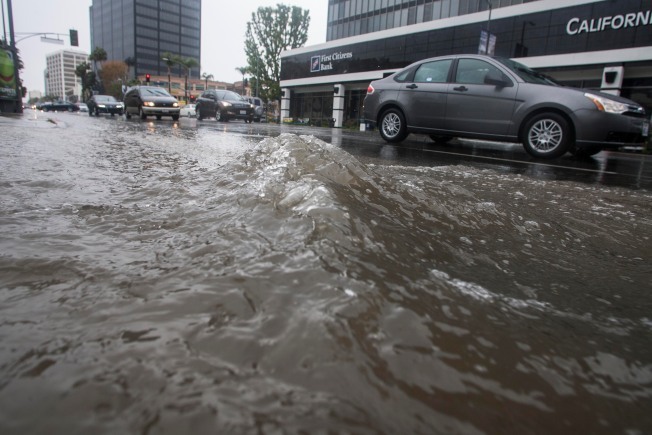 The constant stream of heavy rains will cause urban flash flooding, and the affected roadways include portions of the 210, 5, 405 and 170 freeways, as well as canyon roads from the San Fernando Valley to Beverly Hills and West Hollywood. Flooding forced an hour-long closure of the connector road from the southbound Pasadena (110) Freeway to the northbound Hollywood (101) Freeway near downtown Los Angeles, according to the California Highway Patrol. The roadway reopened just before 9 p.m. Anyone in a warning area was urged to move to higher ground immediately, according to the NWS. Residents along streams or creeks should take immediate precautions to protect pets and property.